This is not news, but I'm going to post it here for anyone who doesn't know who Izumi Tateno is. I discovered Tateno the hard way: sifting through piles of CDs at a used record store for music that I wasn't already familiar with. I came across this collection of Finnish piano music, and after a year or so of owning it realized I kept coming back to it for some reason. Much of the Scandinavian music that Tateno plays is not technically difficult. But there is a way of playing music that makes it seem like there are more notes on the page than there actually are. Or, you could say, a way of playing that releases the music that those black dots are supposed to represent. IMO, this is more difficult than plowing through a barrage of chord progressions. This kind of playing is rare, and this is what Tateno does best. TOKYO -- One evening in January 2002, 65-year-old Izumi Tateno was performing the last piece in his piano recital when his right hand began to wobble. The Japanese pianist, now 71, finished the Edvard Grieg piece with his left hand, and collapsed. He was having a stroke that paralyzed the right side of his body. "In an instant, I lost all the music that I had accumulated inside me for over 60 years," he says. Mr. Tateno still hasn't gained command of his right hand. But after a long, soul-searching journey, he is back on stage performing dozens of concerts a year. He plays music composed especially for the left hand, sitting on a custom-made bench that stretches across the length of the piano to give his left hand full sweep of the keyboard. He has appeared in several documentaries and has even played a duet with Empress Michiko. "Many people have told me I should just take it easy," says the tall, soft-spoken Mr. Tateno. "But I am not interested in taking it easy. I don't even know how to. I want to perform as I have done in the past 50 years, so I can share my music with others." Mr. Tateno's drive to rebuild his career after a late-life illness has resonated in Japan. In the rapidly aging nation, where 21% of the population is over 65, millions are eager to find ways to make their last decades of life meaningful. Thousands of seniors have applied to the Japan International Cooperation Agency, the local equivalent of the Peace Corps, in hopes of serving as volunteers in developing nations. Others are starting up new businesses or signing up to volunteer to help bedridden seniors and working mothers with young children. Hideo Yasuhara, a 71-year-old retiree who had a stroke three years ago, attended one of Mr. Tateno's concerts in September and was inspired. Mr. Yasuhara, a former department-store worker, was already keeping busy taking computer and calligraphy courses at a community center near his house in western Japan. After the concert, he decided to step up his rehab for his left hand, signing up for an intensive, three-week session. "Mr. Tateno made me think I could do so much more with my life," Mr. Yasuhara says. Born in 1936 in Tokyo to a pianist mother and a cellist father, Mr. Tateno grew up in a home filled with music. 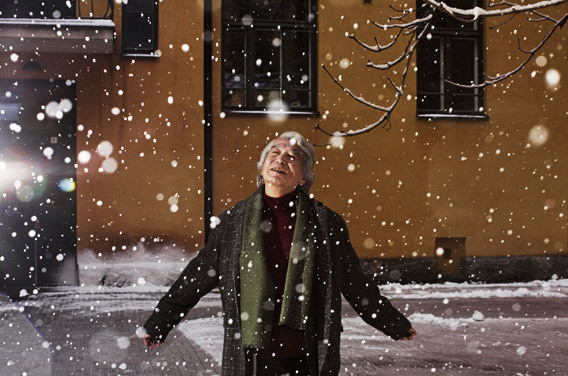 He had his debut as a classical pianist in Tokyo and moved to Helsinki in 1964, lured by the literature and the "pure and slightly sad" atmosphere of Finland. He married Maria Holopainen, a Finnish singer, and they had two children. Mr. Tateno lived in Finland but regularly performed in Japan, captivating Japanese fans with the romantic music of Grieg and Jean Sibelius. Over the years, he gave 3,000 concerts and made nearly 100 recordings. He had just celebrated his 40th anniversary as a professional pianist when he collapsed on stage in a town north of Helsinki. During the first few months after his stroke, Mr. Tateno assumed he would be back performing in a matter of months. But once home, he grew frustrated with the lack of progress. He could move his fingers on his right hand, but it was impossible to hit the same key repeatedly. Sympathetic friends suggested that he play the "Concerto for the Left Hand" by Maurice Ravel -- one of the few widely known piano pieces for the left hand. But the mere mention of Ravel upset him. He wanted to play with two hands. Playing that piece felt like an admission of defeat. "I thought I would never play Ravel even if I were dead," Mr. Tateno wrote in a collection of essays called "The Sea of Sunflower" published in 2004. "I said, to hell with music for the left hand." Mr. Tateno spent his time going to rehab sessions and trying different masseurs. In early 2003, Mr. Tateno's son, Janne, visited from Chicago where he was studying violin. Janne Tateno had found a few piano scores written for the left hand in a Chicago music store. But he didn't give them to his father right away, afraid that he might be offended. He left the scores on his father's piano. Mr. Tateno didn't talk about the scores or attempt to play them while Janne was visiting. But one day, he picked up one called "Three Improvisations for the Left Hand," by British composer Frank Bridge, who had written the music for a friend who had lost his right arm during World War I. Mr. Tateno began to play and got so immersed, he says, that he forgot he was playing with just one hand. "That's when I came to realize that music was music, whether you play it with one hand, or two hands or three," he says. "That realization changed me completely." Actually, quite a few scores for the left hand existed. Many were composed for soldiers injured in wars. The largest collection was written for pianist Paul Wittgenstein, the son of a wealthy Austrian industrialist who lost his right arm during World War I. Mr. Wittgenstein, who later moved to the U.S., commissioned composers, including Ravel, to write music for the left hand. The Ravel piece has also been played by Leon Fleisher, an American pianist who temporarily lost the use of his right hand because of illness, and Gary Graffman, another American pianist performing with the left hand, who also plays several left-hand pieces commissioned for himself. Still, many left-hand pieces were short and not fit for the concert hall. Mr. Tateno asked a few old friends to help. Among them was Takashi Yoshimatsu, a Japanese composer of contemporary music known for his romantic style. "When he first came to me, he had a lot of anxiety, not sure if he could go back to the stage with just one hand," says Mr. Yoshimatsu. Other composers, including music students, pitched in, creating a library of about 30 pieces. In the fall of 2003, Mr. Tateno returned to performing with a series of small recitals in Japan. To give his left hand a rest and to make up for his short performance, he talked with the audience. At one event, a woman asked whether he was frustrated that he couldn't play most of the music he knew. "How can I be dissatisfied when I can express myself fully through music?" Mr. Tateno replied. Mr. Tateno recorded the first of several CDs of music for the left hand and, in Tokyo in the spring of 2005, he performed Ravel's "Concerto for the Left Hand," the piece he had shunned after his stroke. During a performance last year, Mr. Tateno suddenly felt an urge to play a simple melody with his right hand. He tried it and it worked. Mr. Tateno saw his wife, Maria, sitting in the audience with tears in her eyes. "When I play with the right hand, I get a gentle feeling similar to new leaves coming out in the spring," Mr. Tateno wrote in an introduction to his latest tour. "They are still delicate, but maybe in time, they will grow strong."